Preparing for a Children's Party? Preparing for a Children’s Party? Children’s parties are a relatively new experience for us, Little Legs has attended her fair share but never had a birthday party of her own. I’m not really organised enough to pull off a Children’s Party and I wouldn’t know where to start. There’s so much to consider but when the lovely lot at Party Bags & Supplies contacted us to see if we would like to review for them, it was certainly an offer I couldn’t refuse with Little Leg’s 4th birthday just around the corner. Little Leg’s is a huge My Little Pony fan, HUGE, so seeing that they offered a My Little Pony party pack, I knew that it would be perfect. All that I had to do was provide the food, cake and entertainment. The brightly coloured items were perfect for any My Little Pony fan. Isabelle was really impressed with all of the items and the tiaras were a huge hit. I found the items to be really good quality which is what you need when you have a house full of giddy accident prone children. 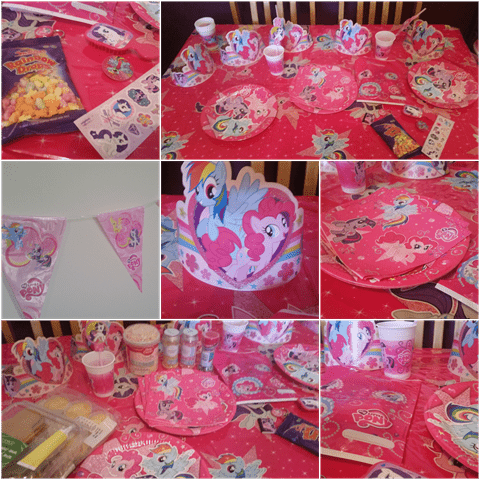 Little Legs was over the moon with the items and hasn’t stopped talking about her My Little Pony Party since. I know that I will certainly be ordering from them if we were to have a children’s party in the future. Previous articleOh Christmas Tree, Oh Christmas Tree….